Intestinal ischemia (is-KEE-me-uh) describes a variety of conditions that occur when blood flow to your intestines decreases due to a blocked blood vessel, usually an artery. 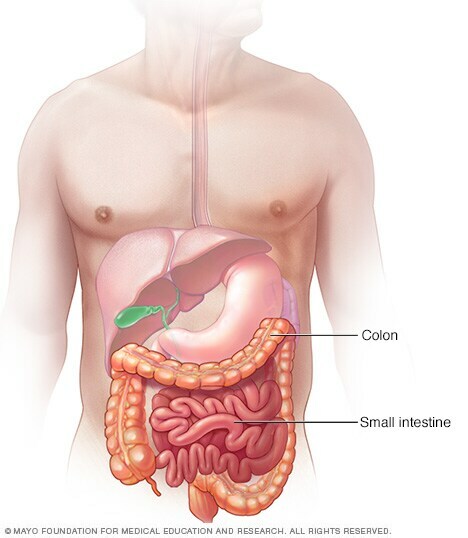 Intestinal ischemia can affect your small intestine, your large intestine (colon) or both. Intestinal ischemia is a serious condition that can cause pain and make it difficult for your intestines to work properly. In severe cases, loss of blood flow to the intestines can damage intestinal tissue and possibly lead to death. Signs and symptoms of intestinal ischemia can develop suddenly (acute) or gradually (chronic). Signs and symptoms may be different from one person to the next, but there are some generally recognized patterns that suggest intestinal ischemia. Seek immediate medical care if you have sudden, severe abdominal pain. Pain that makes you so uncomfortable that you can't sit still or find a comfortable position is a medical emergency. If you have other signs or symptoms that worry you, make an appointment with your doctor. Intestinal ischemia occurs when the blood flow through the major arteries that supply blood to your intestines slows or stops. The condition has many potential causes, including a blockage in an artery caused by a blood clot, or a narrowing of an artery due to buildup of deposits, such as cholesterol. Blockages also can occur in veins, but they're less common. A blood clot (embolus) that dislodges from your heart and travels through your bloodstream to block an artery, usually the superior mesenteric artery, which supplies oxygen-rich blood to your intestines. This is the most common cause of acute mesenteric artery ischemia and can be brought on by congestive heart failure, an irregular heartbeat (arrhythmia) or a heart attack. A blockage that develops within one of the main intestinal arteries and slows or stops blood flow, often as a result of fatty deposits (atherosclerosis) building up on the wall of an artery. This type of sudden ischemia tends to occur in people with chronic intestinal ischemia. Impaired blood flow resulting from low blood pressure due to shock, heart failure, certain medications or chronic kidney failure. This is more common in people who have other serious illnesses and who have some degree of atherosclerosis. This type of acute mesenteric ischemia is often referred to as nonocclusive ischemia, which means that it's not due to a blockage in the artery. Chronic mesenteric ischemia, also known as intestinal angina, results from the buildup of fatty deposits on an artery wall (atherosclerosis). The disease process is generally gradual, and you may not require treatment until at least two of the three major arteries supplying your intestines become severely narrowed or completely obstructed. A potentially dangerous complication of chronic mesenteric ischemia is the development of a blood clot within a diseased artery, causing blood flow to be suddenly blocked (acute mesenteric ischemia). Buildup of fatty deposits in your arteries (atherosclerosis). If you've had other conditions caused by atherosclerosis, such as decreased blood flow to your heart (coronary artery disease), legs (peripheral vascular disease) or the arteries serving your brain (carotid artery disease), you have an increased risk of intestinal ischemia. Age. People older than 50 are more likely to develop intestinal ischemia. Smoking. Cigarettes and other forms of smoked tobacco increase your risk of intestinal ischemia. Chronic obstructive pulmonary disease. Emphysema and other smoking-related lung diseases increase your risk of intestinal ischemia. Heart problems. Your risk of intestinal ischemia is increased if you have congestive heart failure or an irregular heartbeat such as atrial fibrillation. Medications. Certain medications may increase your risk of intestinal ischemia. Examples include birth control pills and medications that cause your blood vessels to expand or contract, such as certain allergy medications and migraine medications. Blood-clotting problems. Diseases and conditions that increase your risk of blood clots may increase your risk of intestinal ischemia. Examples include sickle cell anemia and the Factor V Leiden mutation. Illegal drug use. Cocaine and methamphetamine use have been linked to intestinal ischemia. Death of intestinal tissue. If blood flow to your intestine is completely and suddenly blocked, intestinal tissue can die (gangrene). Perforation. A hole through the wall of the intestines can develop. This results in the contents of the intestine leaking into the abdominal cavity, causing a serious infection (peritonitis). Scarring or narrowing of your colon. Sometimes the intestines can recover from ischemia, but as part of the healing process the body forms scar tissue that narrows or blocks the intestines. In some cases, intestinal ischemia is fatal.